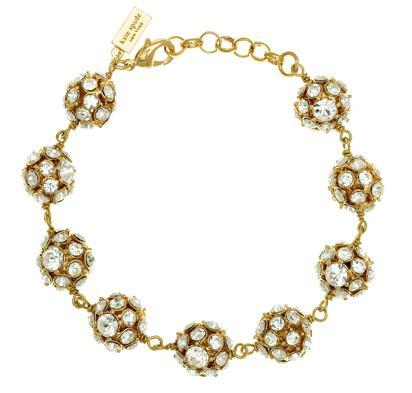 Kate Spade doesn't just make bags – she makes shoes, clothing, glasses, paper and yes, fantastic jewelry. Her designs are smartly simple: mimicking diamonds and gems set in yellow gold, with an old-world flair. Of course, Spade uses glass instead of gemstones and she sets her cut glass in 12 karat gold plate. The bill for the items is consummately low. Take her Gumdrop Studs. They look like amethyst but are not, and at $38 for the pair, they're a steal. Or the Know the Ropes Scatter Necklace – in 12 Karat gold, it's 32" long so it can be looped around twice. The knot motif is old as the hills (think Tiffany) but has been repurposed here for a classy, versatile necklace. My favorite is the Lady Marmalade Small Bracelet. The pave crystals look to me like old world diamonds. They are, in fact, just glass in a clever setting. The perfect selection for an evening out, or even something to dress up a pair of jeans, Kate Spade has classic down to a science. Photo above is from KateSpade.com.